On March 6, it was announced that the Department of Transportation was more than likely to do away with any more progress on the hours of service (HOS) rule, a regulation originally proposed to improve overall health and safety to truck driving jobs. As the findings of the final study come more to light, it shows that the time a driver may take off in order to restart their drive time limit will most likely be left up to the new administration, as it was previously enacted under the Obama administration. While this sounds like good news for truck drivers, individuals and fleets must take into consideration just what the study consisted of to understand the true impact of the probable future ruling. Again in 2015, the Consolidated and Further Continuing Appropriations Act, more commonly referred to simply as “The Act”, stated their desire for the FMCSA to begin a new study. 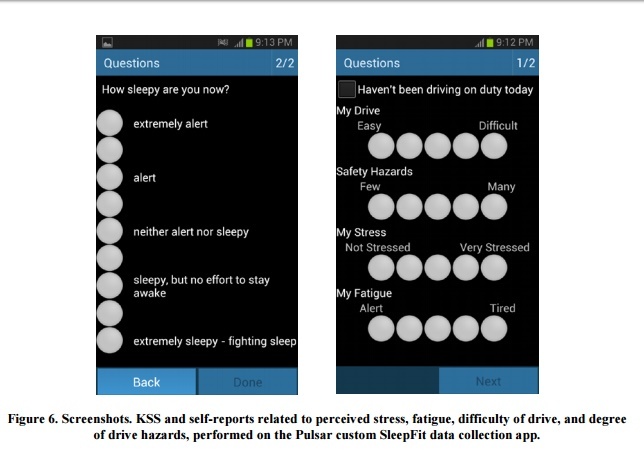 The CMV Driver restart study, conducted by the FMCSA and Virginia Tech Transportation Institute, assessed safety critical events (SCEs), which the FMCSA listed as crashes, near crashes, and/or crash relevant conflicts along with the level of fatigue a driver may suffer from while operating under a rest period of at least two nights compared to drivers who operate their truck with only a one night restart period. The FMCSA conducted this study, according to their plan, with a sample size which would show the effects of their stipulations in the outcomes. To conduct this survey properly, they had to include fleets of all sizes and also truck driving jobs who work in different industries including flatbed, refrigerated, tank, and dry van trucks. Among these truck drivers, they would study their SCEs, fatigue, and level of alertness to determine the driver health outcomes, which would be tested using electronic and captured records of their status while on duty. To accurately calculate this level, they used Psychomotor Vigilance Tests (PVTs), which measures how a driver responds to a visual stimulus during a test measuring sustained attention and reaction time. Along with this, they also used the driver time records as reported by the Electronic Logging Devices (ELDs). Much of the process was also measured with actigraph watches. While wearing an actigraph watch for a week or more, it measures the gross motor activity by keeping track of movements and also light exposure in order to monitor human rest and activity cycles. One last thing used to compare data was camera-based on-board monitoring systems. While the Lytx, which offers DriveCam technology, was the on-board monitoring systems used for the duration of the study, many of the camera based options on the market allow to keep a closer track of safety and fuel use and also allowing managers, or in this case those conducting the study, to see a multitude of driving factors such as how closely they follow other vehicles, how often brakes are utilized, and other unsafe driving activities. Details of the study are very complicated, but in short, the study consisted of a field operational test with a provisional 34-hour restart that would require at least two nights of sleep before beginning the next work week. Those who were chosen to participate in the study were truck drivers that drove and worked for around 70 hours a week and would be looked at for up to five months with 22 chances to be looked at more closely. 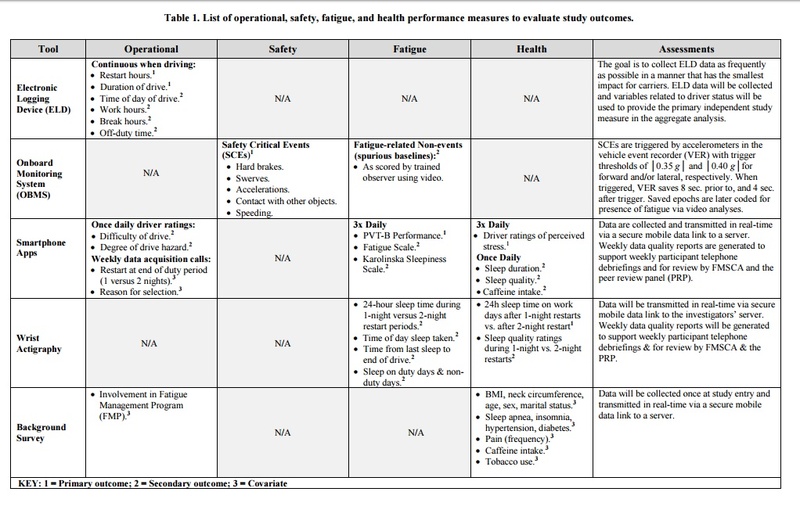 In those 22 opportunities for more concentrated studies of an individual driver, they would assess data related to the fatigue, safety performance, and other data. To do this, they would use the above stated measures to collect electronic information on the effects of their research schedule on work and sleep. Also taken into account to acquire the best results were work outcomes which include the driver's duration of drive and what time of day they completed the drive in, which was studied through ELDs, the difficulty of the drive and and any possible hazards the driver may have faced were monitored by a visual analog rating from the application. They also measured the sleep period of individual drivers along with what time they slept, how long it had been since their last sleep, and compare their sleeping patterns from on and off days through a combination of measurements from the actigraph watch and app. The number of Safety Critical Events captured by the on-board monitoring systems also impacted their study as it electronically recorded any time a driver would use hard brakes, hard accelerations, swerved, made contact with other objects, and drove beyond the speed limit. Fatigue was measured using a combination of the Karolinska Sleepiness Scale (KSS) and a three-minute Brief-PVT. The KSS is a “self-reported, subjective assessment” of an individual's level of drowsiness at that specific time as determined on a nine point scale. To most easily explain this scale, lower numbers from one to six only measure the individual's awareness of fatigue while numbers from seven to nine are differing levels of drowsiness and how much effort it takes to remain awake. To take health factors into account, those who conducted the study evaluated the effects preexisting conditions may have as related to the proposed restart schedule while also determining the effects other health factors such as sleep duration, Body Mass Index, caffeine intake, general pain while driving, and perceived stress may have on the same schedule. With all these factors taken into consideration, it is obvious that this was no small study to take on. Through the combined efforts of the FMCSA and the Virginia Tech Transportation Institute, 500 drivers were subjected to months and months of close study to prove whether or not the new rule would actually help increase the level of health benefits a driver may experience on the road along with overall road safety for the driver and others. The intentions of this study were pure as, according to one website, nearly 500,000 accidents involving semi trucks occur each year. With heavier weights and larger sizes, it is much more dangerous for these trucks to be involved in crashes as opposed to multiple passenger vehicles. The same statistic goes on to say that truck accidents are responsible for more than 12 percent of fatal roadway accidents. 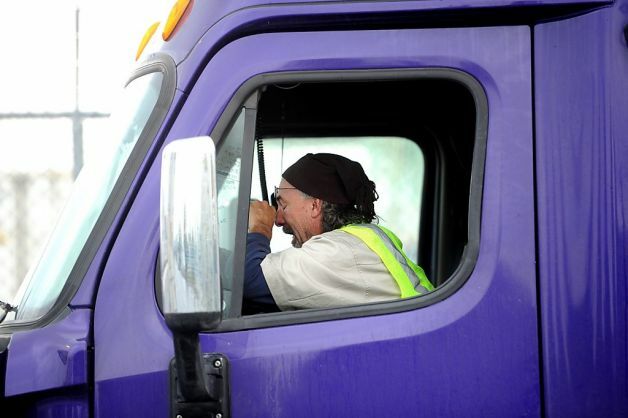 While many drivers had probably already guessed what the outcome of the study would prove, the press release also agreed with many of the problems that truckers had already stated in their original complaints of the proposed rule. One being the increased amount of traffic which would be on the roads during any given time. With more drivers having to take increased breaks to “restart” their drive time, it means that roadways will become more congested due to the sheer fact that more vehicles, both semis and passenger, will be on the road. In short, even a minute amount of traffic increase could lead to a snowball effect potentially devastating the timeliness of the trucking industry. Obviously the increase of traffic on roads which any amount of trucks travel will slow down the delivery and pick up time of a semi. With delayed semis, relationships with shippers and those who get the delivery will be pressed. If the trucking industry cannot maintain a good relationship with the companies they are shipping to, it is less likely they will do further business together. Though the study met all of the requirements the Congress asked for, it is becoming increasingly obvious the old Obama administration will most likely not pass due to the fact there are no real world benefits that will impact drivers directly. While it is likely the rule will not be passed, with a new administration in office, there is the possibility that changes and new studies are on the way.